I follow and read a lot of book review blogs. Like, a lot. Sometimes I feel like I read more book reviews then, you know, actual books. Some people question the worth of reading reviews, because after all books are highly subjective and what one person likes you might not and so on. But I think you have to approach reading reviews in the right way. I mean, if there’s a reviewer whose tastes always line up with yours then you might avoid a book just because they didn’t like it, but I think any good reviewer provides enough information that even if they didn’t like the book, you can take their review and make up your own mind. 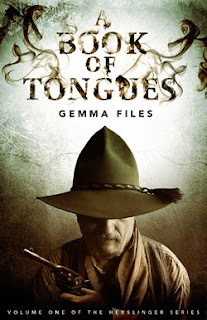 Which brings me to Gemma Files’ “Book of Tongues.” A book I had never heard of until Calico Reaction posted a review of it. Now, Calico was not a fan of this book, indeed she didn’t even finish it. But she neatly outlines the things that didn’t work for her personally, and they kinda sounded like things that would work for me. So I tracked the book down, and I’m very glad I did. I honestly don’t understand why this book is not getting more mentions across the reviewing corner of the blogosphere. Not because it’s necessarily fantastically awesome, (although I rather think it is), but because it’s hugely ambitious. I think it’s the kinda book that you have to feel strongly about, either love it or hate it, and it’s these kind of books I’m used to seeing discussions of. This regiment includes one Chess Pargeter, also known as the reason I loved this book so very much. He’s a whore turned Reverend Rook’s fiercely loyal lover, he’s an indiscriminate murderer, he’s more than a little bit crazy and he definitely makes the book for me. The best character I can think of to compare Chess to is George R. R. Martin’s Jamie Lannister. You start out completely disgusted by him, and by the end he’s your absolute favourite (at least if you’re me). Not that I’m equating being gay with having an incestuous relationship with your sister! It’s more the way that Chess kills so freely and so gleefully, he seems wholly without empathy and it’s easy to dislike him. But by the time the novel ended my heart had broken for him ten times over, and I was cheering for him to come out on top. The transition is completely natural, I couldn’t even tell you the moment Chess went from zero to hero for me, and without changing the core of his character either. It took George Martin four massive tomes to pull that off with Jamie, and Gemma Files does it in just a couple of hundred of too short pages. Impressive? Very. The other characters were just as skilfully crafted. The character arc of Reverend Rook was just as dramatic as Chess’s, and the skill it took to pull it off even more impressive. There is an almost complete lack of women, but given the setting and nature of the book I’m willing to forgive that. (And while the female hex Songbird felt a little flat to me, I loved Chess’s mother, so I’m confident in Files’ ability to write a female characer). The only character I was a little disappointed with is Ed Morrow, our main POV character. He spends most of his time observing and commenting upon Rook and Chess, so we don’t really get to see much of who he himself is. Files does hint at greater depths inside of him, so hopefully the honourable Mr. Morrow will grow a bit in the next books. The writing style and structure is what I think will divide the people who read this book into those who like and those who don’t. It’s told in an odd mix of flash backs and present day scenes. I say odd because it feels uneven, like there will be three flashbacks and then a present scene and then a flash back and then five present scenes… Like when your iPod shuffle randomly throws up five songs out of ten by the same band? The flashbacks and present day scenes are not quite randomly placed, but not quite structured either, and it sticks out. The writing itself is highly stylised. I think Files definitely captured the voice of the setting. Think the southern twang that leaps of every page of a Sookie Stackhouse novel, or the British manners of Naomi’s Novik’s Temeraire books. If by the end of a novel I’m reading it in my head with an accent, then the author has been effective. I will say that some of it got a little confusing for me. All of the Aztec names started to run together, but that’s probably because I am entirely unfamiliar with Aztec legends beyond what I’ve learnt from Mountain Goats albums. And there is a lot of religion. Like, A LOT. Rook’s powers come from the bible, like he reads a phrase and havoc is wrought. (Think turned people into pillars of salt, plagues of locusts, ect). Actually, and this coming from a die hard atheist, I found it be pretty unique and interesting. Normally I can’t stop yawning when reading about characters struggling with their religion and god and what have you, but Files definitely handled it pretty well. And she couldn’t very well have avoided it, with Rook being a once pious Reverend now killing people left and right and enthusiastically sodomising his boyfriend every chance he gets. It is the first part in a trilogy, and the ending is definitely a first part of a trilogy kind of ending. So if you have the patience you might want to wait until they’re all out, but if you’re anything like me you’ll be snapping the next one up as soon is you can! Oh, I have got to read this book. BRETT- That cover is amazing! Don't worry - part of it was because all of the Aztec gods have started to run together. Alright, you've intrigued me. I need to read this, now. Horror/fantasy set around the Civil War with a Jamie Lannister type character? Sign me up.